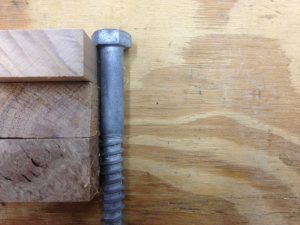 For woodworkers’ purposes, we mostly use the term in relation to lag bolts or screws, meaning a fastener without threads on the upper section of the shaft, which allows one or more of the fastened parts to not be constrained by that section of the shaft. In this example, a properly-drilled hole would allow the threads of the lower part of the screw to engage wood block #3, while lagging, or slipping through blocks #1 and #2. All three blocks would be tightly bound together. In this example, unless block #1 and block #2 are overdrilled, threads may engage block #2 and prevent a snug fit. 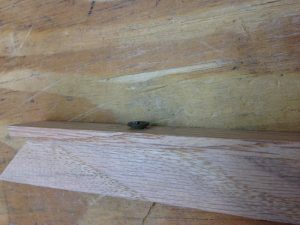 Here, the top piece of oak was predrilled with the same diameter pilot bit as the bottom piece, which allowed the threads to engage, holding the two pieces apart. 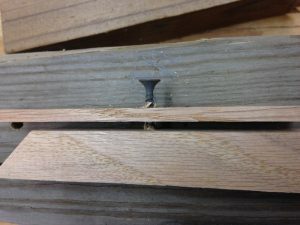 Even though this screw doesn’t have a lag (threadless) section, drilling a larger hole in the top piece of oak prevents thread engagement, allowing the two jointed surfaces to meet beautifully. The top piece of wood is ready for its countersink bit. 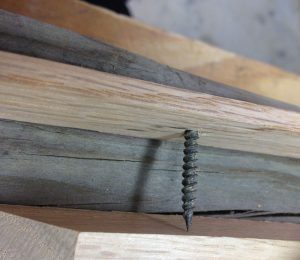 Run a screw through the piece of wood you’re attaching. Drive it all the way in. If the wood is really soft you can often strip the threads it has created, and, voila, you have an unthreaded hole. 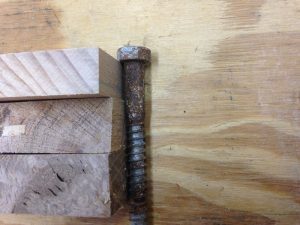 If that doesn’t work, or if the wood is so soft that the head of the screw just continues to get deeper, reverse your drill and back the screw out. All it took for this thin piece of oak to strip is a quick reversal of the drill-driver. When only the tip is in the hole, continue to run the drill in reverse, but push down like you were driving the screw in. In most cases it will push right through the wood, creating the hole you seek. Note: this is a good technique for a DIY construction project, not recommended for fine furniture! 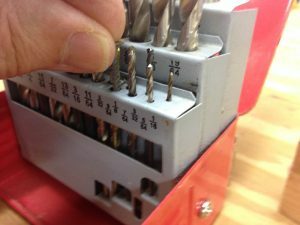 One of the best things about a drill index is having an accurate hole to help determine which bit to use for a specific screw. If the threads engage in the index, they will engage in the wood. If the screw slides through the hole, that bit will work for lag effect.